I was brought up with dogs, my family loved animals, but until we married, my husband Paul hadn’t owned a dog. Our first dogs together were two Jack Russell Terriers, both lived to the grand old age of 18 years old and when they both died we vowed never to have another because we were heartbroken, says Julie Greenwood. But then three years later one of my friend’s had a litter of Beagles. We saw Benson our first Beagle when he was only one week old and we brought him home at eight weeks. After two years, we decided to bring another Beagle into our homes and we brought Chuck, Benson’s nephew, home at eight weeks old. They got along brilliantly and we were a very happy family until illness struck and at just 10 years old, Benson lost his battle with cancer. Our house was so lost without him and Chuck missed him so badly. Browsing online one day, I saw a sad little Beagle girl called Tinks on Beagle Welfare. She was somewhere between three and five years old and she was looking for a new home. It was love at first sight when I saw her sad little face. I asked Paul if we could we adopt her and he refused. Since we had lost Benson he had lost two stone in weight and he was still trying to adjust to our empty house but after two hours of begging he finally gave in and we booked to visit Tinks at Beagle Welfare. We told a few friends who were in the Beagle community and word spread as Benson was so popular amongst them all, they missed him as much as we did, it was then that we found out the story about Tinks. She had been rescued by a lady named Claire, who we now call Tinks’ fairy godmother. All the lovely Beagle community were right behind her for saving Tinks and a fund was set up, so many contributed to saving her. Claire had seen a sad image of Tinks up for sale on the internet for £400 and she and her lovely daughter rushed to save her from a horrible man at a service station. He had Tinks’ head tied so close to the bars in the boot of the car that she couldn’t move her head. She was in a sorry state covered in fleas and oil when Claire handed over the cash for her. 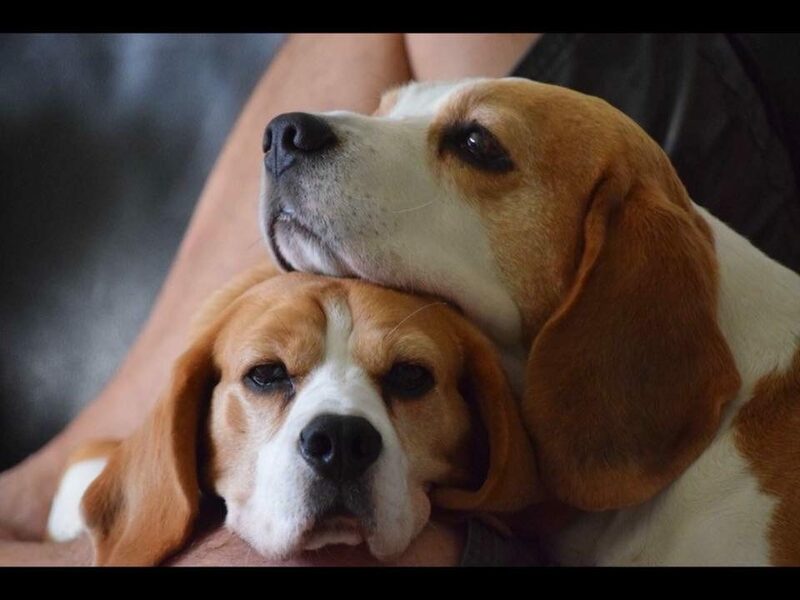 I knew nothing of this story until I told a friend I was going to see Tinks at Beagle Welfare and they told me all that had happened, so I decided to message Claire to tell her we were thinking of adopting Tinks and since then we have remained close friends. She and her daughter have visited us and Tinks knew and recognised them both which was really touching. When we first brought Tinks home it wasn’t easy, to be honest. Chuck was then eight years old and he sulked. He wanted nothing to do with her and she was such a sad little girl, she just wanted to sit close to him, but he would just move away and he sunk further into his shell. We were distraught and thought we had made the wrong decision, but after a few weeks, he came around. It took about a month for Chuck to fall head over heels in love with our beautiful rescue girl and now they are inseparable. When we first brought Tinks home, we knew that she’d never been in a house. She wasn’t house trained and didn’t know what a TV was. She was terrified of the yard brush. If one ever came near her, she would shake all over. If you raised a voice in any way, she would cower. She didn’t like men with bald heads, sunglasses and wouldn’t walk past a white diesel van. Every action and reaction told a story of what her life was before she was rescued. But with time and TLC, she settled. Tinks has been a part of our family for three years now and it has been an absolute pleasure to see her evolve into the naughty Beagle she was never allowed to be. You have no idea how much pleasure it brings us. The first sign that she was becoming a naughty Beagle was when she started chewing. She chewed everything in sight, including my most treasured pair of Ugg slippers. And their replacements. It was like having a puppy again. In our minds, she was being the pup she probably wasn’t allowed to be. She’s calmed down now but when the mood takes her she still has a chew at something. Tinks is constantly surprising us doing things that show us more of her personality. Over the last three years, she has developed the typical female ‘Beagle voice’. When she does it, Chuck runs and hides under the table because it usually means she wants to play and she doesn’t play in a very ladylike way. She likes to greet us by stretching up gently to us with paws and she looks so happy to see us. I love how she understands what we say to her now if we say ‘walk’ or ‘would you like a treat?’. We love how she is the boss of the house now. She has become a mischievous, noisy special girl. Like us, Chuck is just happy to sit by and watch her confidence grow. Adopting Tinks has been the most amazing journey. It hasn’t always been easy, but it’s amazing what love and security can do for a sad puppy farm girl. Without Benson, we would never have been part of the Beagle community and found out about our beautiful girl. As much as we helped her to heal, she helped us too. What Does a Psychiatric Assistance Dog Do?